The pictures were taken att Wilkesbacka where Anette Mattsson keeps her horses. Actually, this filly's pedigree is full of Swedish champions, *Cadyk was also Swedish National Champion stallion. 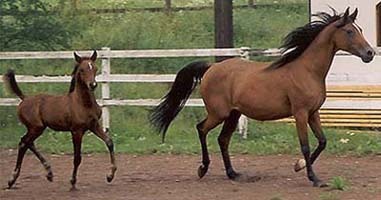 Sapala's grandfather Dardir was one of the first purebreed stallions in Sweden (in modern times) and, as you might guess, Swedish National Champion stallion! Further back we find champions like *Exelsjor and sires of champions like Algier. Sapala's sister Saleta (Etnograf x Saldara) was Swedish National Champion filly. Sapala is also the dam of Salaterka. Her mare family is one of the most sucessful families in the world, that of Milordka. The branch Sapala belongs to came to Sweden in 1962 when Dr Arvid Aaby-Ericsson imported the mare Sakla and her filly *Sake by El Trypoli. Sakla was a full sister to Estokada and half sister to Canaria and Sedziwoj, both by Trypolis and thus closely related to *Sake since her sire El Trypoli was by Trypolis. The Milordka family has three major branches, that of Anielka 1909, that of Siglavi-Bagdady 1908 and that of Koalicja 1918. Sapala belongs to the branch of Siglavi-Bagdady. This branch is probably the most important, with individuals like Fetysz, Saga, Canaria (with another line to the Milordka family through Koalicja's son Enwer Bey), Gwara, Cosmosa, Estokada, Celebes, Eskapada, *Elkana and Ekstaza. Before she was exported to Tom Chauncey Arabians in the US, *Sake produced *Salexja by *Exelsjor, Saudi by Dardir (stallion in Germany) and *Polisa by Pohaniec. *Salexja was the dam of Salamalaika by Algier, Polka by Pohaniec (dam of Primo), Sanda by Dardir, *Sagana by Engano (broodmare extraordinaire) and the stallion Amarath by Pohaniec. Salamalaika produced Saldara by Dardir, Sanicja by *Cadyk and Salexa by Exodus.